It just takes one person to start a movement. That's exactly what happened when Gene Chaney of Ransom Canyon, Texas was concerned about the lack of housing for the homeless in his area. Chaney's daughter Melissa and his son-in-law own Harris Homes and Interiors. He called Melissa to tell her about the desperately needed homes for a local nonprofit. Following other inspiring stories of tiny home villages for the homeless, the Harris' worked together with local nonprofit Paul's Project to build tiny homes for Grace Campus (formerly known as Tent City). After getting a generous donation from a local Lowe's, they began building. 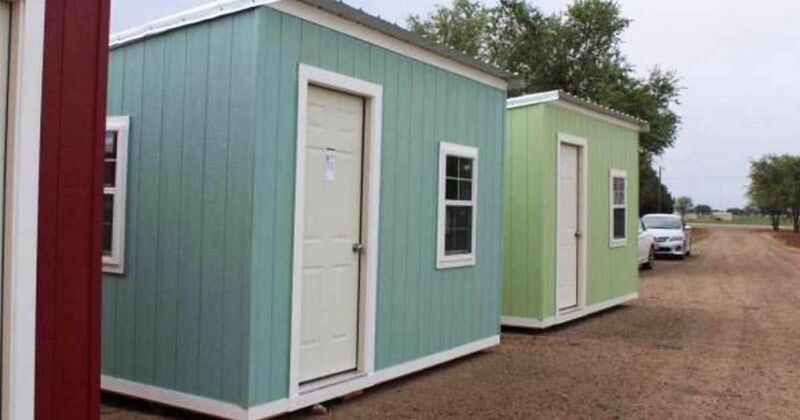 After one successful build in early August, the company has continued to put together 13 120 square-foot homes for Grace Campus, all supported by donations. Each home costs only $2,500 to build, and the program is always looking for donations, no matter the amount. The low-cost is due to the simple design of the plywood homes that include insulated panels and a solar panel on the roof. “Everything was thought out to where we could make it as simple to maintain as possible,” Harris told Lubbock Online. With Chaney and the Harris' help, the homes will be able to provide the "sense of community and authentic change" that Grace Campus aims to bring for as many people as they can serve.